On my many visits to Hawaii, I have not been to the Dole Plantation since I was a little girl. This visit, I was lucky enough to have my friends Alison, Anna and Christeil join me! This was Anna's first trip EVER to Hawaii and Alison's first time to Oahu...so visiting the Dole Plantation was on our list as we travelled up the north shore to eat. Of course...one of the top eating reasons to be here was the Dole Whip! Here is a super quick reaction. I wanted to keep it short so I could send it to youtube right away, but then encountered some tecnical difficulties! So I will elaborate on the how good it tasted! But before I do, I want you to check out the other ways you can get your Dole Whip! OMG! 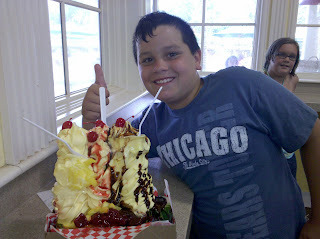 I couldn't believe it either when i saw this boy's dad carrying this GINORMOUS whip sundae to the counter! I just HAD to take a picture! It's totally insane...and I think there was like 3 of them eating it! The girls enjoyed it just as much as I did! And I know, our little bowl looks so pathetic in comparison to that gigantic beast of a sundae...but we wanted to taste the whip in its natural pure state. It was so delicious and the flavor of the pineapple was so fresh! Like I said in the blip, seriously, the version they sell at Disneyland does not come close to this one at all. It was so incredible how much pineapple flavor you get!! I loved it!! I sure wish the Dole Pineapple Plantation was closer to my house!!! I'd be there every other day!! That's right...you're eyes are not deceiving you! Spam flavored macadamia nuts!! I know!! I was tripping out too! In all my years, I've never seen it! Perhaps I just never noticed it...I don't know! I loved the Dole Whip and so did the girls! So if you're ever on Oahu and heading towards the North Shore, stop by the Dole Pineapple Plantation and pick up your own whip! The regular bowl was the perfect size for me...but if you are adventurous and have a massive appetite, you know there are sundaes of every size to feed you tummy! This was so worth the stop and it's the perfect cool, refreshing treat on a hot day!! !